Be the first to share your favorite memory, photo or story of Geroge. This memorial page is dedicated for family, friends and future generations to celebrate the life of their loved one. George Llewellyn Wilder, started his spirit journey on April 4th surrounded by those he loved and who loved him. Born in Waldport, Oregon he grew up and lived most of his life in Humboldt County. 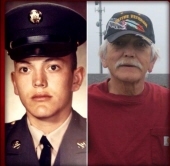 George was a Vietnam Veteran who served his family and country proudly. He worked on fishing boats on his return and worked in the lumber mills. George returned to school and attended D-Q University (Tribal University) in Davis California earning two A. A. degrees in computer science and Native American Studies, this is also where he met his beautiful wife Elsie. He transferred to Humboldt State University where he received his B. A. in Social Science and Native American Studies. Upon graduation, he took the position of Director of Indian Education for Northern California Indian Development Council until he retired. George loved to hunt, especially duck hunting, and spent many hours getting his guns and equipment ready for the day. He was at home hunting on the Wilder/Ferris Family hunting grounds. Anyone that knew him knew that he was a lifelong supporter of the San Francisco Giants attending many games with his friends, but he loved the game even more when they would beat those Dodgers. George also loved his San Francisco Forty-Niners and just spending time watching any kind of sports or car shows. Surviving are his wife of thirty years, Elsie, son John Lee (Selene), grandsons Alex and Devin, Brother Stanley Wilder, Dennis Costa (Erika), Brother in-laws, Alan Quinn, Bryan Griffin (Darlene), Stanley Griffin, Warren Griffin (Kristie), father in-law Stanley Griffin, Nephews, Stan Quinn, Scott Quinn, Shane Quinn, Ed Griffin, Zech Griffin, Noah Stanford, Kohl Stanford, Stanley Griffin IV, nieces, Leslie and Elsie. He is preceded in death by his beloved sister Lillian and his older brother Butch. As per Georges request there will be no viewing or service. He chose to be cremated so he could travel upriver to Karuk Counrty to Salmon Summit, and to take a ride with his nephew in his hot rod for one last road trip. But his heart will stay on the Klamath, with his wife. To plant a tree in memory of Geroge Lewellyn Wilder, please visit our Tribute Store. "Email Address" would like to share the life celebration of Geroge Lewellyn Wilder. Click on the "link" to go to share a favorite memory or leave a condolence message for the family.